Just Say No To Rugs, Drugs and Plugs ! Ok ......, sorry.......,we were just trying to give this photo a cute, clever caption. We couldn´t resist the male pattern baldness spread evenly amongst the local police department. 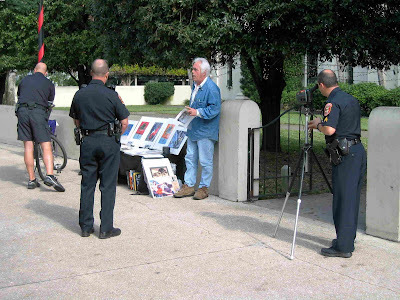 The St. Augustine police were taping the process of giving Suvo a $100 ticket for displaying his art for sale on St.George Street. You cannot tell by this photo but Suvo has the same "monk´s pate" as the officers. The Center for Krishna Consciousness people (maybe, maybe not ) were selling baseball hats a few feet away but no ticket was issued and they weren´t lucky enough to get on film. Suvo was ordered to move back into the Plaza and did so, joining the geegaws, trinkets, plastic jewelry and various sunglass vendors. 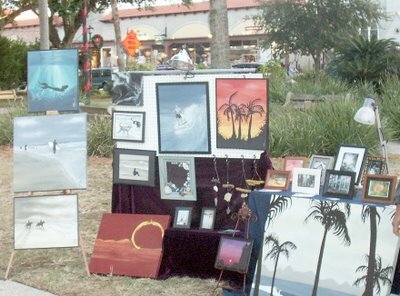 "........... visual art and wares, which means drawings or paintings applied to paper, cardboard, canvas, cloth or to other similar medium when such art is applied to the medium through the use of brush, pastel, crayon, pencil, spray or other similar object"
The above is a description of visual art from the St. Augustine City Code. This is what happens when attorneys and bureaucrats come up with definitions. How many works of art are excluded if this list is used as a guideline? Duchamp´s "Fountain" would have a hard time making the cut here. For that matter, all sculpture is omitted. Here is a good definition of sculpture for our junior assistant City Attorney Robin Upchurch. Sculpture is art that you can walk around. 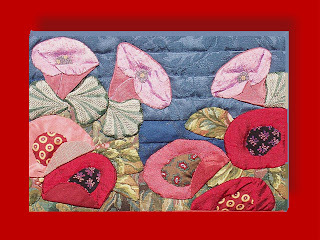 Art In The Market artist Helena Sala uses fabric, needle and thread as did the studio of Ruebens. Read More. The following post is from a press release by artist Suvo. Suvo will be setting up his exhibit on St. George Street this Saturday. This appears to be illegal according to City Codes. Is it? Stay tuned, kids. The Federal Court (Bery vs City of New York . 1996) has determined that the display and sale of visual art (paintings, prints, photographs and sculpture) is protected under the First Amendment, therefore the forum of public parks. streets and sidewalks are open to visual artist´s expression and sale. In our nations oldest city St. Augustine, former City prosecutor James Whitehouse has told artists. “It doesn’t matter what the law says, we make our own rules.” Simple unobtrusive art displays and sales have been illegally banished from St. George Street. Arrests have been made and artists have been handcuffed. We contest this restriction upon free speech. Requests have been made to amend the local ordinance to comply with Federal law. These requests have been ignored without a response. This restriction is a phony, citing health and safety hazards. In reality, business interests are considered a higher priority than fundamental guaranteed rights. We will no longer tolerate a pattern of harassment and infringement of visual artist´s rights. Your rights could be next to be ignored. 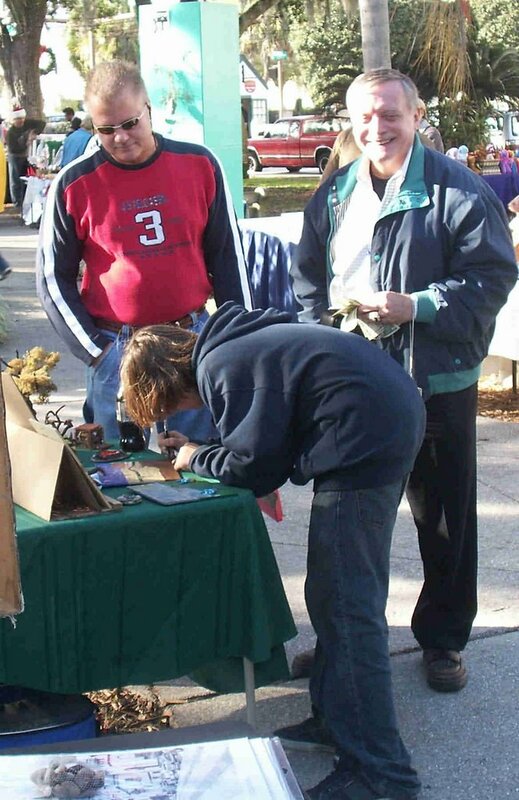 Harrisburg, Pennsylvania Mayor Stephen Reed (right) accompanied by Commander Richard Pickles (left) of the Harrisburg Police, purchases an artwork from 13 year old painter Marc Sala shown here (center) signing his painting on wood panel. 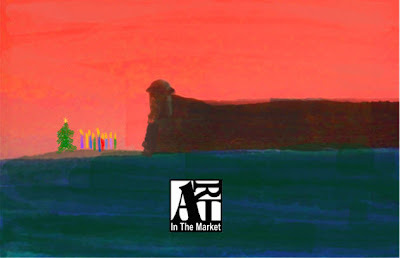 Art In The Market encourages young artists and suggests that the beautiful public spaces of the nation´s oldest city makes a perfect venue.The mayor has held the office of mayor for over 23 years ! Read about his remarkable career here. Mark´s bona fides will be published here shortly. Recently seen strolling through the Plaza ........British actor Bob Hoskins and another spotting of comedian John Byner with his wife Anne. Sure this is Florida , though we are about 75 miles from the border of Georgia. It can get cold we can tell you, but when the nation gets an arctic blast we still appreciate the chilling 54 degrees. Some refer to us as living in South Georgia though we never hear of our Valdosta friends as being from North Florida. We believe that this is a dig into a perceived state of mind. It is no longer the 60´s although we´ve seen and heard remnants of the old bigotry but not as often as I did back in my midwestern hometown. Generalizations almost always lie. That´s our friend David Saunders on his "Conference Bike". 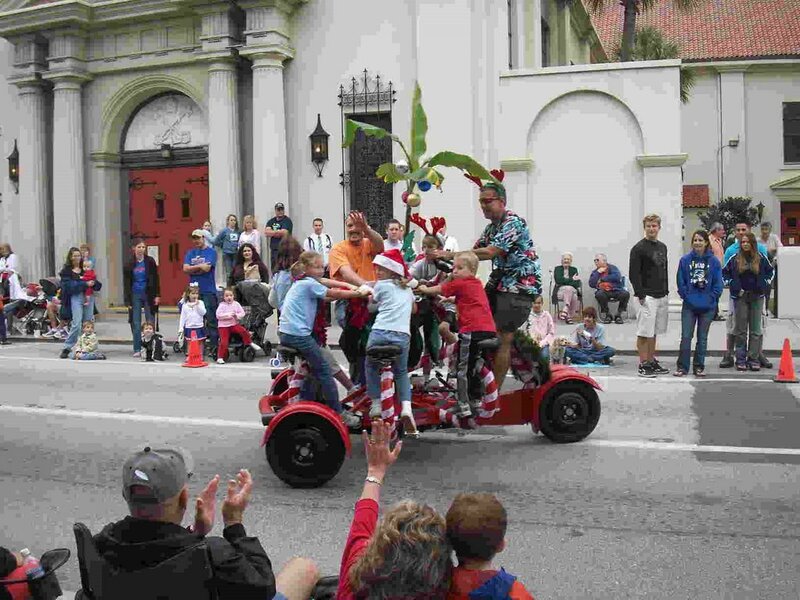 He and a gang of kids are passing the Basillica (First and Oldest Parish in America) while in the Xmas parade. David´s bike is an engineering marvel. Made in Germany with a Porshe steering system and dual hydraulic brakes it is a sight around town that brings out the cameras. David has had many interesting visitors on his bike, not celebrities or famous people, just interesting people. David is not impressed with fame (he lived in Manhattan at 33St and 33 Ave near PS 166 so he has seen it all.) Take a ride on David´s Conference Bike. He is not sure what to charge so take advantage. Hey!W e saw these guys sneaking onto St. George Street one late night. That´s the ride that we want. 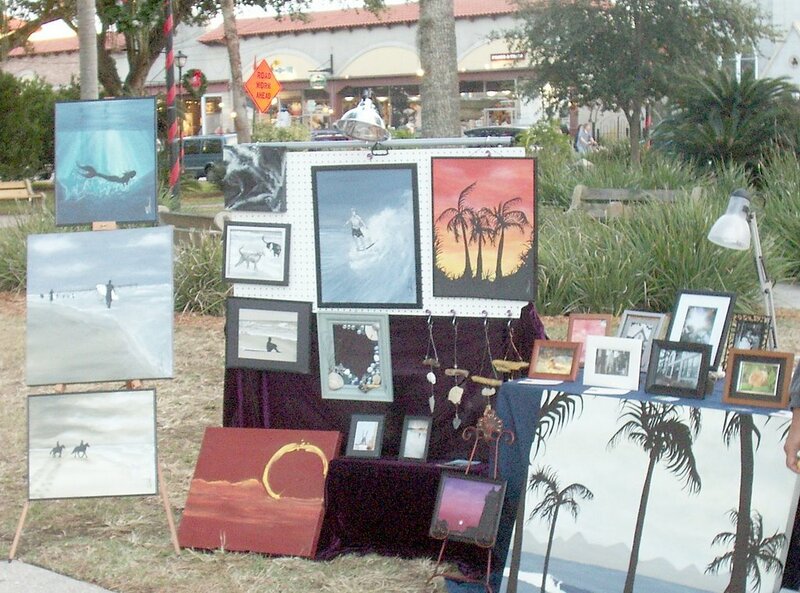 This is the Plaza display of Art In The Market artist Sherri Adriano. 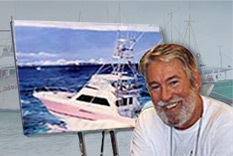 Many of Sherri´s images evoke the vastness of the ocean from the beach P.O.V. Whether its surf riding, dogs playing in the beachside foam or palms in silouette against a large sea, Sherri captures a mood that is distinctive. Sherri is also a mural painter and designer specialized in faux finishes. Sherri Adriano´s website is here. 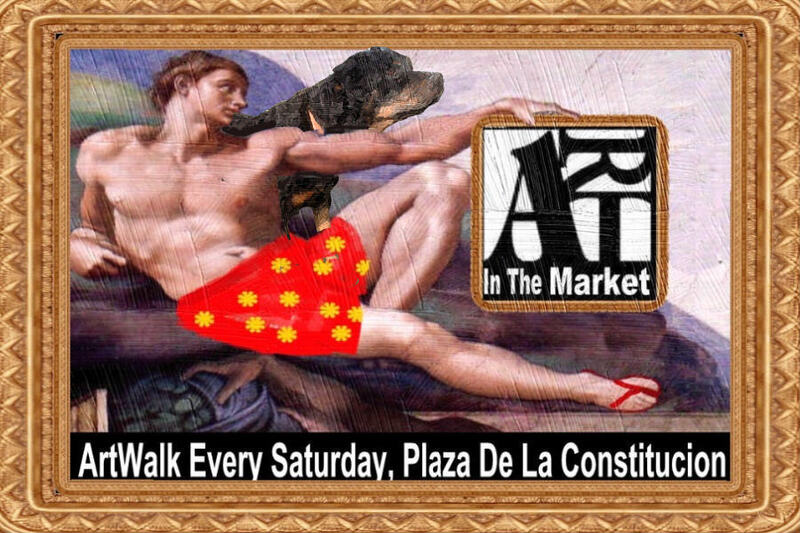 You will find her weekends at the Plaza De La Constitucion Artwalk. 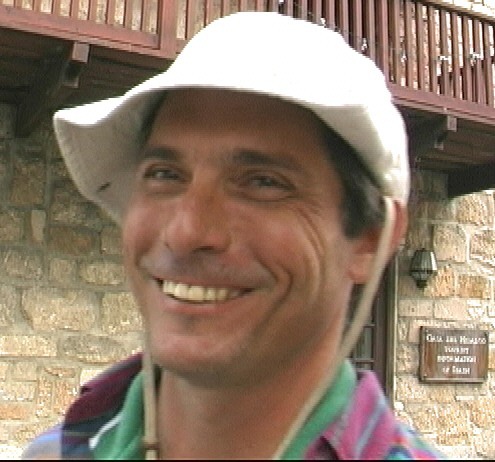 Recently we met Vaughn Cochran, artist, fly fisherman and conservationist. Black Fly Outfitters at 11 Aviles Street is an art gallery, fly shop, bookstore and museum. 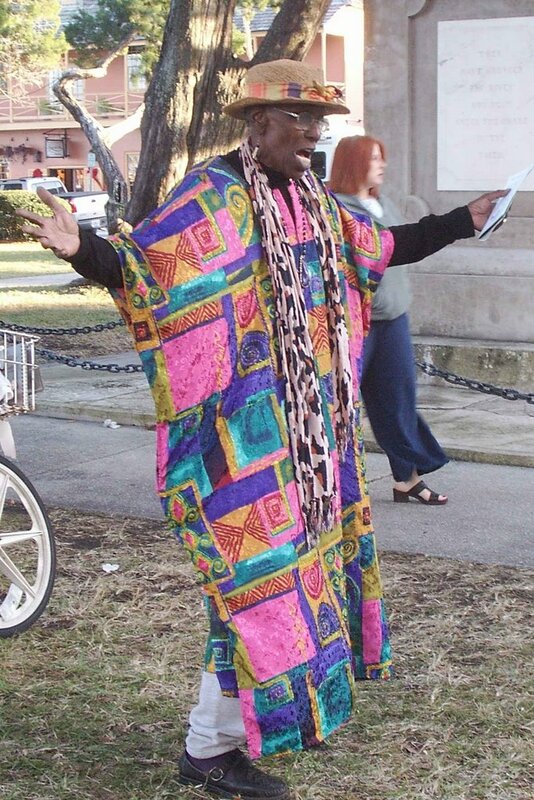 Look Here Vaughn is the current head of Art Galleries Of St. Augustine. Art In The Market was very much interested in Vaughn´s concern to upgrade the level of items for sale in the Plaza. One item of agreement is that the City could do more to prevent the proliferation of flea market type merchandise. Unlike Visual Art, the city does not have a obligation to mercantile sellers. Perhaps a plan (with a minimum fuss) could be formulated. Art In The Market would also love to help more tourist find Aviles Street (easily the oldest street in North America , excluding native American footpaths ) We have our eyes on an existing pathway from St.George St. through the Plaza to the Arch over the Aviles entrance. Meet Lorelei. 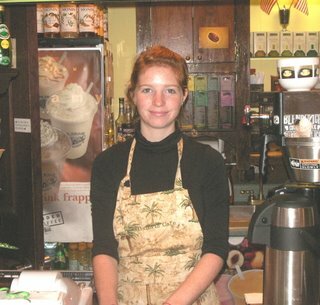 She is our barrista at the Historic Cafe, serving up lattes and bagels just yards away from the Plaza on Cathedral Place. Lorelei is quiet and kinda shy, but we coaxed a smile from her for this photo. It wasn´t difficult. Lorelei is a junior at St. Augustine High School. 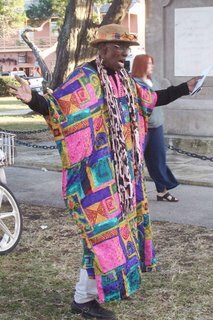 Our friend Carrie Johnson (The Voice Of Lincolnville) sings Xmas Carols and spirituals for the visitors to the Plaza. Carrie interprets music passed down from the city's earliest Spanish beginnings, through the spirituals of St. Augustine's period as a safe haven for runaway slaves, to the era of the civil rights struggle. Art In The Market loves Carrie though she is ......gasp!........a Republican ! Scott Raimundo has been a visual artist on St. Augustine steets for over 10 years. Last Sunday, Scott had what someone termed a "mental meltdown". He was seen and heard (loudly) throughout the Plaza screaming over and over "I´M GOING TO RAKE YOU ! ",I´M GOING TO RAKE YOU ! ,while brandishing a metal easel over his head. 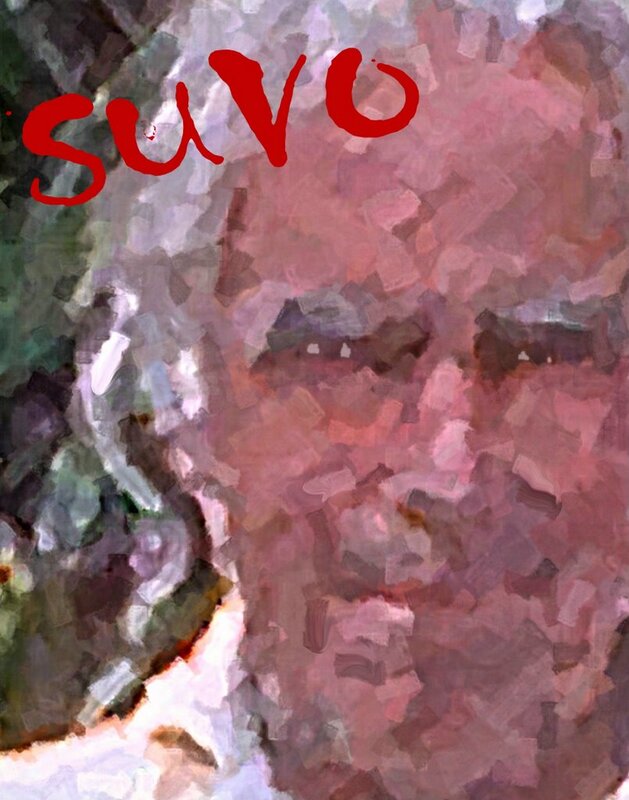 The recipient of Raimundo´s tirade was another artist, Suvo. A tourist called the police and things calmed down before they arrived. 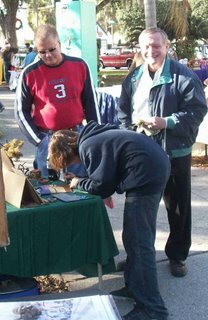 Art In The Market would like to gently remind vendors and artists that we are highly visible in the Plaza and such behaviour is not good. Scott was reported to say later that " I had been drinking whiskey and eggnog all morning and afternoon". Suvo said " "I´m not sure what set off Scott but he sure got out of the wrong side of the bed that day". According to the St. Augustine Record , Scott had had a similar altercation with the police five years ago when the police had to get him into a headlock. Bystanders suggested to the police that Scott was "mentally disturbed". Such is the nature of many great artists. In his CV sheet Scott claims to have been born the same day that Vincent Van Gogh shot himself. This would make Scott 116 years old! Scott has written in his bio that he is" a visionary, a dreamer and a painter of big thoughts ". Art In The Market agrees, and we want Scott to continue his career and find Vincent´s passion without the traces of mental illness that Van Gogh exhibited. Our thoughts on Suvo.........well.....he is beyond redemption.